Koinonia Nuba is an offspring of Koinonia Kenya, a Christian Community founded in 1988 by Father Renato Kizito Sesana, a Comboni Missionary. It is an organization of lay Christians committed to the promotion of the church’s social mission, the implementation of social and educational projects, and the empowerment of self-help groups. 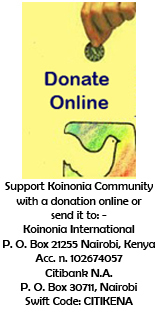 The Koinonia Community has operations in Kenya, Zambia and Sudan. Koinonia Nuba was registered as a local nongovernmental organization, under section 11.2 of the New Sudan NGOs Act 1999, in September 2005. Its operations are based in Gidel, Nuba Mountains. The schools run by Koinonia Nuba in the Nuba Mountains work in strict cooperation with the Parents' Teachers' Association (PTA), which is an organized body that formulates decisions that enhance the achievement of schools’ objectives. Koinonia Nuba commits itself to the service of the Nuba people, and to work in solidarity with them to enhance education, cultural pride, elaborate Nuba identity, as well as to promote social equity and fundamental human rights.